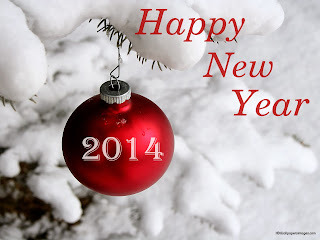 As we come to the end of another year, I want to wish you all a blessed 2014. I know that 2013 has had many moments of joy and celebration, but it has also been laced with pain and heartache. It seems to me, that as I get older, that I have become more aware of the bitter-sweet moments of life. When I was younger, things seemed more simple, trouble free and less painful. As we get older we realise that life is like a bag of mixed sweets - good treats, sour sweets, hard candy, soft sweets and so on. We can't choose our own bag of sweets, but they all contain a mixture of good and bad. What we can choose is how we deal with Life and the issues we face. We can also choose to include God in our lives and trust in His guidance, love and mercy. As you face another year, may you place your hand into the hand of Jesus. Walk into the unknown with a God who will shine His light on our path. God takes no delight in seeing us stumble and so he urges us to listen to his voice - God will navigate our way through whatever Life throws at us. I also want to thank you for your support and encouragement in reading these 'Living in Grace' posts. I pray that they continue to inspire you in your faith. The word 'horn' in this verse could also mean, 'strong one' or 'king'. God raised up his Son, as the strong one/King that they desperately needed. Jesus comes to be our strong one too, no matter how far away from God we feel. This is the Good News that we long to hear. And the reason God does all of this, is because .... we are close to God's heart! May this knowledge sink deep into our spiritual memory. There may come a time when we really need to remember this. I found this wonderful post Christmas prayer and wanted to share it with you. It is written by Scotty Smith - I have cut it a little shorter, but I am sure you will still get the point. Enjoy reading it and I encourage you to pray it for yourself. Father, my prayer today is for all of us, no matter what Christmas was like. For even our best days are in need of the gospel, and none of our worst days are beyond the reach of the gospel. We always have more of your grace than we’re aware of and we need more than we realize. When the shepherds left Jesus’ manger, they were still shepherds. They still couldn’t worship at the temple; they still couldn’t give testimony in a court of law; they still were stereotyped as thieves by many in their community. A five-star inn in Bethlehem didn’t suddenly open up for Joseph and Mary the day after Jesus was born. She wasn’t spared any of the normal chaos and pain of birthing and afterbirth. Angels didn’t begin showing up as round-the-clock nurses. Father, thank you that we don’t have to pretend about anything. Christmas isn’t a season in which we’re supposed to be transported into a super-spirituality, rising above reality. The gospel isn’t about denial but is about learning to delight in you, no matter what’s going on. We praise you that Jesus came into a real world where everything is broken, but he did come to make all things new, starting with us. Please give each of us the special and the common grace you gave the shepherds. Let us hear and let us see more of Jesus, even if we remain “shepherds” the rest of our lives. Father, enable us to glorify and praise you in every season and situation of life. We are a people of hope, not hype, and everything you tell us in your Word will come to pass. Our past is forgiven, our present is in your hands, and our future is looking really good. This is good news for shepherds and kings alike. So very Amen we pray, in Jesus’ faithful and loving name. I read somewhere that there are nearly 6500 known languages on our planet. The most popular is Mandarin, with nearly 2 Billion people speaking the language, followed by Spanish (400 million) and then English (335 million). Whatever language is spoken in your household this Christmas may we all know come to understand God's great message of Love. May we all get to appreciate and comprehend God's love for humanity. And may you have a blessed Christmas. ... and his greatness has reached the ends of the earth! "The true light that gives light to everyone was coming into the world. He was in the world, and though the world was made through him, the world did not recognize him. He came to that which was his own, but his own did not receive him. Yet to all who did receive him, to those who believed in his name, he gave the right to become children of God— children born not of natural descent, nor of human decision or a husband’s will, but born of God. If there ever was a verse that confirmed the old saying: "We want to comprehend a God with 'skin on'", then this is the verse. This Advent, may you come to understand and know God in a deeper way. May Christ's mercy bring joy to your heart today. Can one person change a nation? Well, in South Africa we would definitely say 'Yes!' 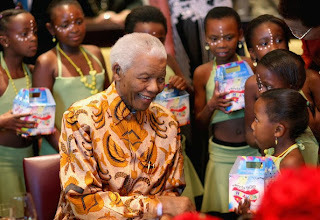 It has been clear this past week that the Madiba Magic has not died, but it lives on. In fact, it is almost as if Nelson Mandela's death has rekindled some of the hope we held as a nation. During the last few years it seems as if we have lost our way, as a nation, but Madiba's parting gift to us is to wake us from our slumber. Our gift to him would be to live as people of hope and reconciliation. Let me ask us another question - Can one person change a world? Well, it seems as if Nelson Mandela has come close to bring the entire planet to a stand-still, even if it is just for this week. He has been trending on Twitter all over the globe; written about in every newspaper in the world and is constantly being mentioned on facebook, blogs, websites and news bulletin's in every country. He has impacted our world in a major way - that is undeniable. However, let us not forget that Madiba modelled many of his values (forgiveness, reconciliation, love, and mercy) on another man - Jesus Christ. And it is Jesus who continues to change the world, 2000 years after his birth. Jesus inspires Hope in people, even today. Jesus offers forgiveness to all who would receive him. Jesus cares about the widows, orphans and children. One person can indeed inspire Hope. I thank God for Jesus. I thank God that Madiba knew Jesus. 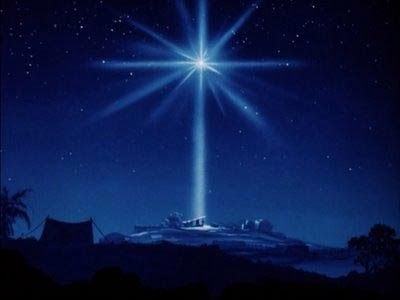 This star is deeply symbolic for Christ-followers for a number of reasons - it reminds us that Jesus is a light in a dark world and that God will guide us, even when things don't seem to make sense. It also teaches me that even the stars can point us to our Saviour. So this Advent Season, may we follow the signs that point us to Jesus. It is with sadness that we say goodbye to Nelson Mandela - I found myself welling up with emotion as I watched the tributes and film clips on TV - he is indeed an amazing man. But to move a world to tears is a unique gift. Only a few people will ever be given that privilege. If you are near Pietermaritzburg on Tuesday evening the 10 December at 6pm, we are going to host a short service of remembrance for Madiba. It will be held at Wesley Methodist Church. It is hard to sometimes know the difference between 2 things that appear similar at a glance. Take for example, glass and perspex. If you quickly look at something that is made of perspex, you could easily mistake it as being made from glass. In the end, this may not make a massive difference to anyone, but we need to acknowledge that they are different! 'My friend,' I said to him, 'That is not your cross. It is your wife's cross, but it is your sin!" I can sometimes fool myself, but others know the truth. I may think that my character, lifestyle and choices, are a result of the influence of others (and there may be some truth in that), but in the end, I need to be real enough to admit the truth - it could be my sin! Let's not confuse perspex with glass! Wouldn't it be good to remember that life is like going on a run - we encounter many things and people on the road of life, but we have a close companion .... Jesus. 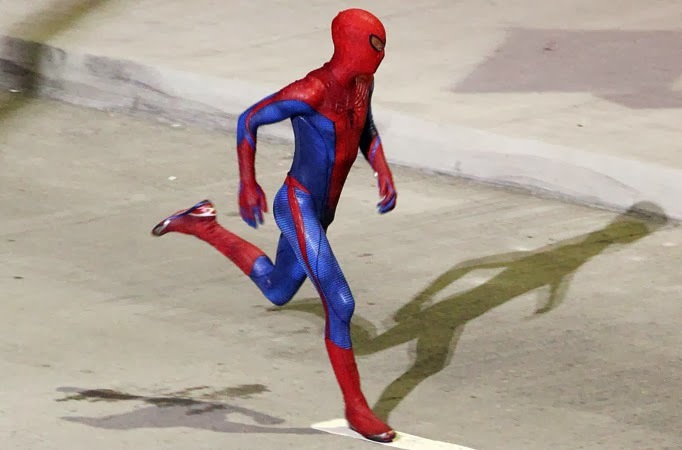 Running the race of Life with Jesus is so much better than running with any superhero - no matter how cool Spiderman is! 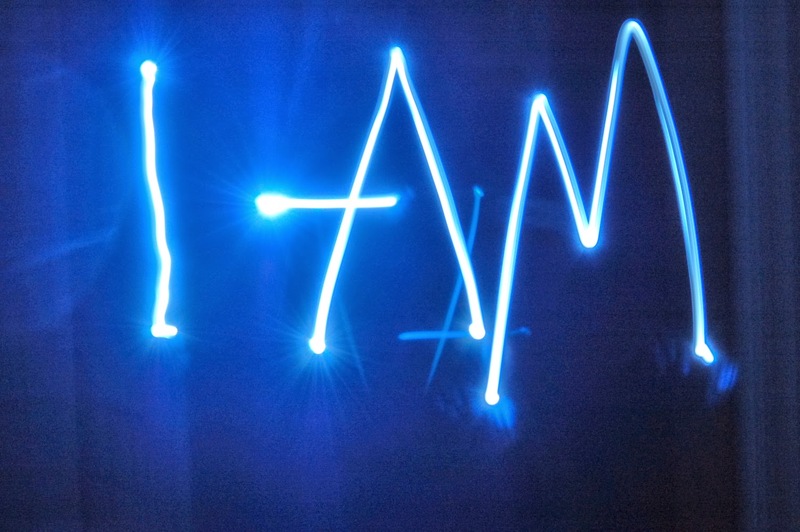 There are a number of people who have written autobiographies starting with the words "I am...."
Take for example Zlatan Ibrahimović - his is entitled, "I am Zlatan" and is appropriate for a professional footballer who has a giant ego! Another one is Malala Yousafzai - her autobiography seems more "humble" than others, but her story is still remarkable. She is the Pakistani teenager who was shot in the head by the Taliban, when she was just 15 years old. She is an activist for education and women's rights in her country. In my opinion, anyone who is willing to stand up for her principles, like Malala did, deserves recognition. 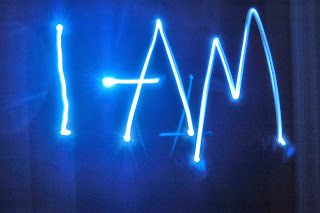 In the build up to the birth of Jesus there is someone else who uses the phrase "I am..." - it is the angel Gabriel. His statement is one of introduction, but equally one of authority. Gabriel was revered by the Israelites and so to stand before Zechariah and declare, "I am Gabriel" - wow, that must have been immense! No wonder Zechariah couldn't speak for months! It takes a lot to ignore the pain and suffering we encounter and to seek the positive in life. As has been said before, 'Attitude is everything.' If you are getting bogged down by all the negative in our world, why not try and look for something beautiful. This could be from anything or anyone. It is easy to be drawn to the dark parts of the world, as they so readily shout for our attention, but let's remember that God is still Creator and Redeemer. If we focus on the Life offered to us in Jesus, we will begin to notice the small sparks of beauty. 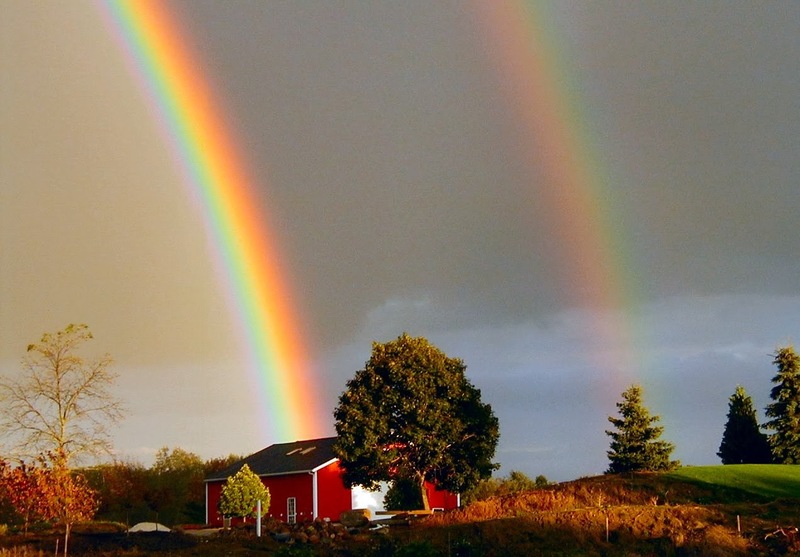 After all, it was God's idea to send the rainbow after the flood. Let the light of Jesus fill you to overflowing. In preparing for today's message I came across this poem/song. 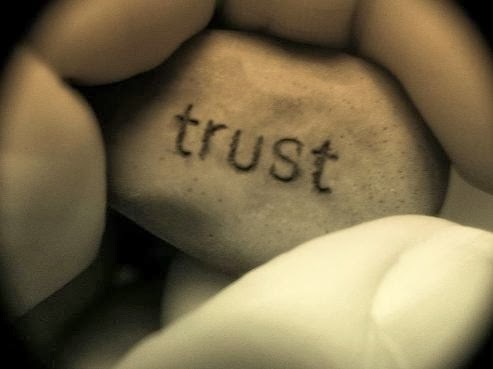 I know that 'trust' is something we all struggle with, often wishing we were able to trust more in people and in God. Is the only place of rest.” - Source Unknown. I guess the wonder of Trust is that it usually works best when we realise that our options are few - if you like, we find ourselves humbled by our circumstances, and so we can't do it all alone. 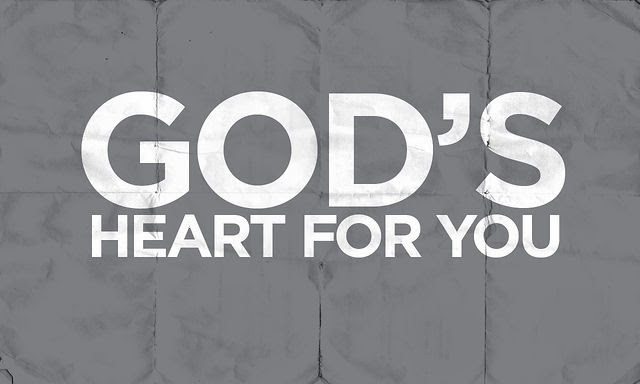 Putting our trust in God and others is a humbling experience, but it can be so liberating. Today marks the first day of Advent and I pray that we may learn to trust in God this Advent season. The arrival of our Saviour reminds us that God can be trusted in all things. God fulfilled his promise to bring Hope, Light and Love into our world.